Use up those Thanksgiving leftovers in these versatile and customizable Stuffin' Muffins. Freezable and reheatable for quick meals later. Preheat the oven to 375 degrees. Thaw and squeeze the spinach dry. Add the stuffing, turkey, and spinach to a bowl, then stir lightly to combine without breaking up the stuffing too much. Liberally coat each well in a muffin tin with non-stick spray (or butter). Divide the stuffing mixture between all 12 cups. Leave the stuffing loosely packed in the cups so that the egg mixture can fill in the empty spaces. In a medium bowl, whisk together the eggs, milk, salt, and pepper. Divide the egg mixture among the 12 cups, filling each about 1/2 to 3/4 full. The eggs and stuffing mixtures will expand during cooking, so try not to over fill. 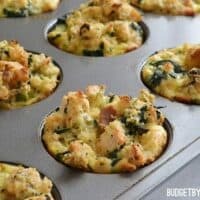 Bake the muffins for 25-30 minutes or until lightly golden brown and crispy on the top. Allow the muffins to cool slightly, then run a knife around the edges to loosen and remove each muffin. Make sure to coat well with non-stick spray or butter. These muffins will stick to the tin if not well oiled. Feel free to get creative with the add-ins. Roasted vegetables, cheese, or other meat make great additions.